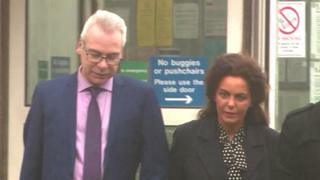 A former health boss has been given a suspended prison sentence for paying her husband £11,000 of NHS cash. Paula Vasco-Knight admitted paying her husband Stephen, 46, for work on a publication which never existed. She was CEO at South Devon NHS Foundation Trust and national lead for equalities for NHS England at the time. The 53-year old was given a 16-month prison sentence, suspended for two years, and ordered to do 250 hours unpaid work by Exeter Crown Court. Mr Vasco-Knight admitted submitting an invoice to the NHS in 2013 knowing he had not produced any work. He was sentenced to 10 months, suspended for two years, for his involvement and ordered to do 150 hours unpaid work. The pair initially pleaded not guilty to fraud but later changed their plea to guilty. Image caption Vasco-Knight was awarded a CBE in 2013 for "services to the NHS"
When questioned by police the pair provided a document which they claimed Mr Vasco-Knight had produced. But it emerged material in it was copied from a document from the King's Fund which had not been publicly available at the time the couple claimed it had been created. Mrs Vasco-Knight was given an honorary doctorate by the University of Exeter in 2013 and received a CBE in 2014 for her work as an ambassador for equality and diversity within NHS England. In one set of ratings the hospital was ranked as the 10th best performing in the country in 2012 and she was named as the best in her field at the NHS Leadership Recognition Awards in that year. Sue Frith, managing director of NHS Protect, which conducted the investigation, said afterwards: "Between them, Paula and Stephen Vasco-Knight defrauded over £11,000 of NHS money that was sorely needed for its intended purposes."